Steamer Point was always a nice spot for a gentle stroll along the cliffs and back along the beach, but was a little short even by my modest standards. In 2004, however, Christchurch Council was able to acquire the last section of private cliff-top between here and Highcliffe Castle, and has now opened up a Coastal Path that runs all the way from Mudeford Quay to Chewton Bunny. This not only allows the Steamer Point Walk to be extended to a decent length, but also provides something to aim for (and a cup of tea when you get there). Alternatively you can head back the other way to the dependable Avon Beach Cafe and the Beach Shop with its remarkably good range of local interest books. The Car Park is quite difficult to find; if in doubt, follow the signs to the "MCA Training Centre". Of interest are the remains of the post-war experimental satellite station hidden in the trees, and (although little is left of them now) the willow sculptures. The Steamer Point Visitor Centre (Tel: 01425 272479) is located at the entrance to Steamer Woods. In the grounds of Highcliffe Castle (which also has a Visitor Centre), is the Highcliffe Tea Rooms which also provide a welcome refreshment stop. 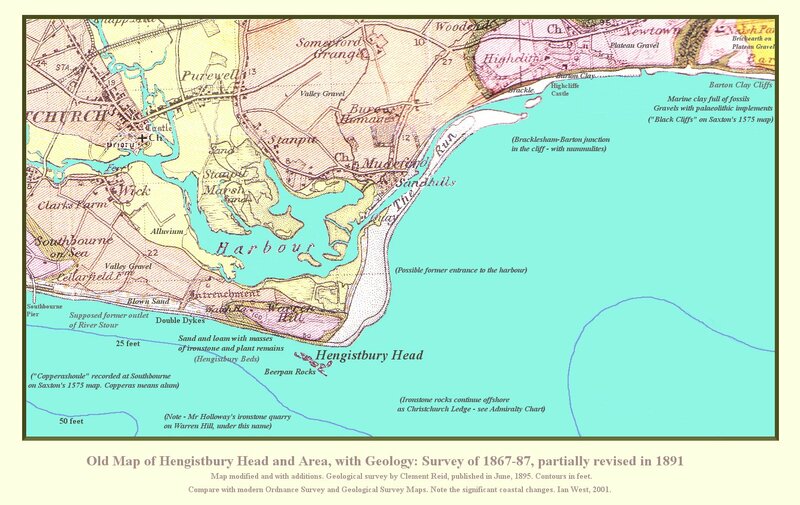 Fascinating old map on the University of Southampton's site showing how the River Avon used to reach the sea by Highcliffe Castle. Part of a much larger article.